As it was Mother’s Day, my lovely mum got to choose where we would go off for the day. She chose one of our favourite places- Cenarth Falls in Ceredigion. Cenarth is on the border of Pembrokeshire, Ceredigion and Carmarthenshire so we visited three counties without having to drive too far! We have happy memories of visiting here with my dad too and it was nice to show the younger kids the falls for the first time. The village of Cenarth is so pretty with bright painted windows and ornate gates (I love the Welsh dragon one- I really should have had a photo taken with it #rockthatgate style!). Then there is the stunning natural beauty of the River Teifi, a salmon leap and of course, Cenarth Falls. We parked on the southern side of the river, which is free and as an added bonus has toilets! Parking is reasonable on the other side too and is closer to “the falls”. We enjoyed the walk through the village (taking care crossing the roads as some pretty fast lorries unexpectedly travel through and having to hop on the road single file in some parts). There are plenty of picnic benches near St Llawddog’s Spring (Ffynnon Llawddog) so we ate there. This spring used to be regarded as a holy well, so I thought it was apt that there was a spiritual light over Danny in the picture (caused by the Sun really of course). The namesake of the well, St Llawddog ( St Ludoc) lived in the 7th century. A son of the King of Usk he was, according to tradition, responsible for many miracles. He is chiefly associated with North Wales where he was Abbot of Bardsey. There are a number of churches dedicated to him in Carmarthenshire and Pembrokeshire including Cenarth and Cilgerran. After our picnic in this picturesque spot, we walked on to the falls. Along the way we passed a red telephone box, which of course, all the kids had to pile into. We then walked over the bridge which was built in 1788 by architect David Edwards, son of William Edwards the designer of the old bridge at Pontypridd. Once over the bridge, the kids enjoyed exploring the tunnel holes in the bridge. 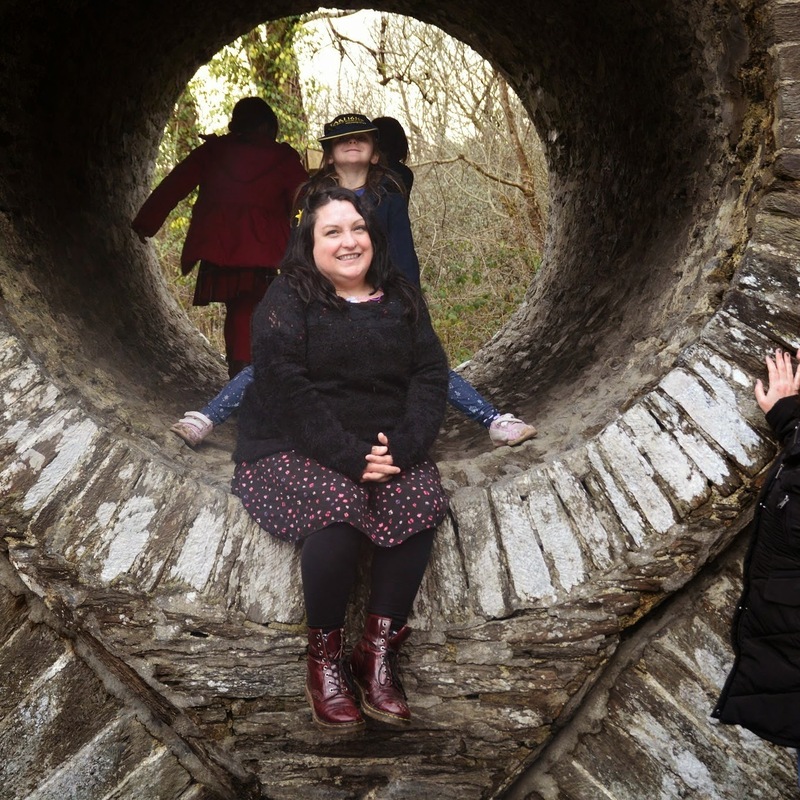 The hole in the bridge is designed to ease the load on the main arches but has provided fun and photo opportunities for many families over the years-I’m sure I could find a photo of me in the tunnel as a child too! We all laughed when Dave “helped” me up there on this occasion- I somehow ended up lying flat for a while, laughing hysterically and unable to turn or lift myself up- I am so grateful no-one took a photo of me in that position! Jo said that she aims to climb up to the tunnel on her next visit here too, so she has a new spot stroke goal! We then walked over to the falls. Autumn is the best time to visit if you want to see salmon leaping but it is gorgeous all year round. You may recognise it from an old Timotei advert! Cenarth Water Mill now forms part of the Cenarth Coracle Museum which will be open again from Easter to September. Dave and the kids walked on past the falls while mum, Jo and I took in the views. We spotted Dave and the kids from afar. I said, “They’re fine! They’re waving!” then did a double check that they were waving “Hello” and not “Help!”. Thankfully, it was the former. We also had fun taking a selfie of the three mums on Mother’s Day. Many unflattering photos and even videos were taken- I never thought I would say these words but I think we may need a selfie stick! The girls needed the toilet again when we were this side of the river, so we walked to the nearest public ones. These were closed as it was out of season but had a note stating that we were welcome to use the toilets located in the local petrol station instead so we wandered in there. We also bought drinks too as we felt bad just using the facilities but I’m sure they’re used to it! There are two pubs in Cenarth, The White Hart Inn and The Three Horseshoes Inn. There are also cafes, The Salmon Leap Gift Shop and Cafe and Tytecenarth, so you could easily wile away a day here. I’m looking forward to visiting again in the Summer to visit the Corcle museum and during the Autumn in case I spot some salmon leaping. I’d like to visit the Church too. The noble river Teivi flows here, and abounds with the finest salmon, more than any other river of Wales; it has a productive fishery, which is situated on the summit of a rock, at a place called Canarch Mawr, the ancient residence of St Ludoc, where the river, falling from a great height, forms a cataract, which the salmon ascend, by leaping from the bottom to the top of a rock…. The church dedicated to St Ludoc, the mill, bridge, salmon leap, an orchard with a delightful garden, all stand together on a small plot of ground. It hasn’t changed much over the years! Do you remember it and recognise Cenarth?